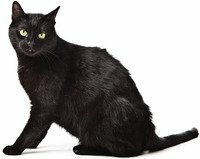 Attention Cleveland, Ohio, residents: On Friday, October 5, and Saturday October 6, six shelters will allow people to adopt lack or mostly-black cats free of charge. All pets come vaccinated and spayed or neutered. As part of the program, a second kitten of any color can be adopted for $20. According to the Best Friends Animal Society, black cats are frequently overlooked at adoption. Although there’s no exact reason why these animals are passed over, suggestions include they aren’t as photogenic as white or other felines of another color; and superstition, such as the expression about how black cats bring bad luck. Black cats are also the pet of choice for witches who populate children’s picture books and Halloween decorations.